With workspace available for companies large and small this centre is located on the 2nd floor of this nine-storey building in Bambalapitiya, Colombo 4. 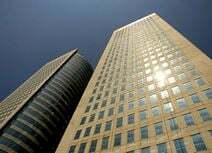 It has good public transport links and is home to tenants that include HSBC and Samsung. In the heart of Colombo you will find this nurturing and creative entrepreneurial community. A centre offering more than just office space, become a part of a community of like-minded people with access to a colorful and active event calendar, special deals and services through their network, modern meeting and event space, as well as exposure to potential customers, investors and mentors. Fueled by the three 'C' core values: Community, Collaboration, Creativity, this centre has a strong focus on each member's individual success and aims to catalyse both your self-growth and business development, as well as enhance your connections with potential collaborators. With amenities like a rooftop breakout area, exclusive events, 24/7 security with fingerprint access, 100 MbSec fibre-optic WiFi, a modern board room, office equipment, a kitchen to show off your culinary skills, plus free fuel to function properly! (coffee, Ceylon tea and that occasional Lion beer) Join today so you can start enjoying all this space has to offer. Enjoy working differently at this well-equipped office space. A mixture of private office and coworking solutions are available. All utility costs are included. There is free tea/ coffee and bottled water to keep you hydrated and on the go during the working day. You will have access to training and business support. Frequent social and networking events are on offer. Situated on the corner of Deal Place and R. A. De Mel Mawathe. Step outside the space and enjoy a variety of restaurants including; Thai, Chinese, Subway and many more. Next door you will find a bank and ATM. Kollupitiya Railway Station is a 12 minute walk from the space. Mahanama Bus Stop is 2 minutes' walk away. Alternatively, there is plenty of accessible on-street parking. Situated in the prime area of Colombo 7, this centre is moments from excellent shopping and dining options. A centre that is easy to reach by bus or train, or by car with parking available onsite and nearby. Providing a range of workspace solutions to suit individual needs, from pay-as-you-go to flexible plans and fixed term options for the memberships, drop-in business lounges, hot and permanent desks, private offices and virtual office solutions in this prestigious and efficient business address. 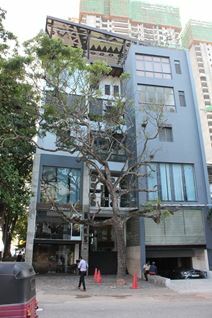 This centre is in a building that houses some of Sri Lanka"s best known apparel and IT companies. The closest bus stop is just 10m from the building and is surrounded by commercial activity. The World Trade Centre, where this centre is located, towers above the city skyline, offering panoramic views of the harbour and the city. Set in the heart of the Colombo's CBD, this centre has great access to high-end hotels, restaurants, shops and more. Providing a prestigious business address, this centre has pay as you go, flexible plan and fixed term workspace solutions from access to business lounges and meeting rooms to dedicated co-working desks and private offices. Come in, sit down and get down to work. This space comes with free Wi-Fi, 24/7 access, meeting rooms and event space to accommodate your working needs. With additional amenities such as a microwave, fridge, lounge area, and free tea and coffee, this space gives you the opportunity to relax all in a comfortable and air-conditioned environment. This space is local to cafes, restaurants, shops and gas stations, and less than half an hours drive from Colombo. Take a short drive to Nugegoda Shopping Complex and access it via public transport or a short walk from the train or main bus stations if that takes your fancy. Community members also have free access to social and networking events as well as invites to investor meet-ups and membership access to the entire network of the operator's spaces. 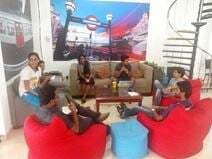 Situated on Galle Road, right next to Subway and just across the road from Odel this mini hub is a great place to set yourself up for work. With 24/7 access and a great laid back vibe, this hub is a great place to de-stress while working. Free access to social and networking events, as well as invites to investor meet-ups and membership access to the entire network of hubs is included for all hubbers so why not sign-up today? Enjoy the unlimited free Wi-Fi and extra amenities such as a microwave, fridge, bean bag lounge area, and free tea and coffee in a comfortable and air-conditioned environment. As well as the locality of restaurants, international fast food outlets, and local supermarkets. A co-working space and cooperative organisation for entrepreneurs, creatives, freelancers and hustlers to work on their ideas, projects and ventures. Beautifully designed for productivity, creativity and focus, with sea views from the co-working area. A community without hierarchy, with values of equality, gratitude, giving back, growth, honesty and failing fast. Local to hotels, cafes, restaurants, retail venues and banks, with easy commuter links via bus and train. 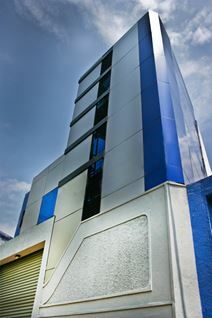 This commercial building offers suburban office space in Delkanda, Nugegoda are suitable for immediate occupation. The business centre provides a range of serviced office suitable for between three and 40 people and offers great connection to roads, bus routes and railway transportation. Only a twenty minute drive from Sri Lanka's capital, Colombo, this centre is a great location for those wanting to get out of the hustle of the city but still maintain connection. With affordable prices and flexible terms this business centre is located on the 9th floor of a newly built commercial complex in Colombo and offers a mix of fully furnished executive suites and open-plan office space. Situated within the tallest completed building in Sri Lanka, this serviced office space is on Level 35 & 37 and provides a prestigious home to your business. Offices are complemented by world-class meeting and conference facilities along with on-site support by a professionally trained bilingual Client Service team.